Catalog number: KP1047. Catalog number:KP1047. The fun-filled activity panel can also be removed from the walker for extra sit-down play. With lots of exciting activities, cheerful music, and friendly phrases, little ones will be introduced to numbers, shapes, animals, and colours. Red Kite Go Round Twist Baby Walker. 5 out of 5 stars - Red Kite Go Round Twist Baby Walker. 2 product ratings2 product ratings - Red Kite Go Round Twist Baby Walker. Pink Musical Baby Stroller Walker. Adorable stroller styling encourages early role play and nurturing. 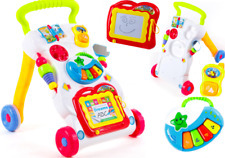 Colourful, imaginative and action-packed this sturdy baby walker from VTech will help to support and nurture your baby's first steps and includes a variety of activity attachments that will keep them entertained on the go. All with the added benefit of easy assembly and its small compact design, making it easy to storing in small spaces. Features a detachable learning centre packed with activities. Sturdy design. Supports: brain power, senses, hand to eye co-ordination and physical development. Batteries required: 3 x AA (not included) plus . For ages 6 months and over. Excellent condition and comes from a smoke and pet free home. 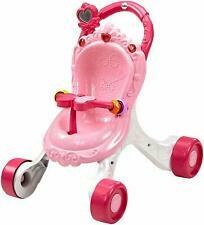 Musical baby walker colour pink .used sometimes very good condition. All with the added benefit of easy assembly and its small compact design, making it easy to storing in small spaces. Batteries required: 3 x AA (not included) plus. Unopened and new, never used. Walker features textured wheels, easy grip handle and durable design. Remove the panel from the walker for fun sit-down play! The Day we got this my kid started walking on his own and never played with it. New mint condition. Maven’s First Steps Portable Walking Aid. Condition is New. Dispatched with Royal Mail 2nd Class Letter. 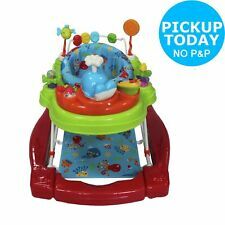 VTech First Steps Musical/Activity Baby Walker. first steps baby walker. Condition is Used.magnetic drawing pad missing. otherwise in good condition and very lightweight. Perfect for Soothing Sore Gums. Light and Easy to Hold and Chew. A ccrington B aby C entre. Adorable stroller styling encourages early role play and nurturing. A press of the “magic” wand button rewards baby with songs and fun sounds. The clacker beads and butterfly flip book help foster fine motor skills, too.